We shouldn’t wait until our brushes get to this sorry stage to clean them. 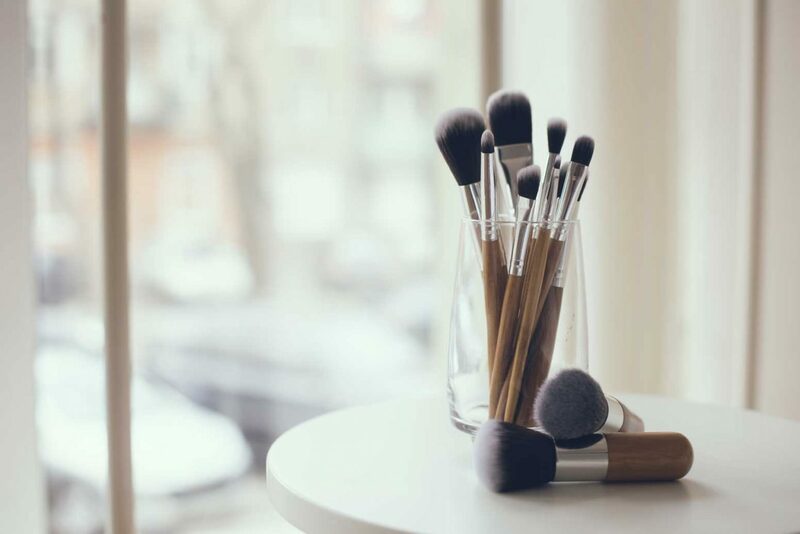 Ideally, makeup brushes and sponges should be cleaned at least once a week. Without frequent cleaning, bacteria may accumulate on the brushes, and can often lead to breakouts. So by all means, avoid a potential zit-uation (sorry, couldn’t let that opportunity slip), and bathe those brushes! It’s always a wise idea to use lukewarm water and gentle cleanser when cleaning your brushes to maintain the integrity of the bristles. Lukewarm water will lift and dissolve the buildup without being hot enough to weaken the glue securing the bristles. Several companies sell quality brush cleansers (Real Techniques sells a great gel version), or you can even use some spare Johnson’s baby shampoo for a gentle and thorough cleanse. Just as we always set out a nice dry towel to cling to ourselves after a shower, we should also lay one out for our brushes. A hand towel is usually the perfect size for even a hefty bundle of brushes. I also like to have a small dish nearby filled with a pool of my chosen cleanser. This allows you to readily apply the cleanser to your brush hands-free, avoiding any potentially slippery disasters. At this point, the cleanser-filled dish and towel should be laying out close by, warm water flowing and brushes at the ready. Gunk, grime, and goo: banish these bad guys from your makeup brushes with 5 simple steps! Step 1: Pick up the brush and run the bristles under running warm water until they are soaked through. Step 3: Apply the bristles to the palm of your hand and swirl them around to loosen the makeup (do so with both your hand and the brush under the water). Muddy rivulets will stream out for several seconds up to a minute. Step 4: When the water from your bristles runs clear again, press your thumb and index finger over the bristles and slide them down to squeeze out any excess water. Tap the bristles to reshape them and lay the brush on the towel. Step 5: Repeat for all your brushes and allow them to dry for 10+ hours (I usually wash my brushes before I go to sleep, so they can dry overnight). By morning, they’re ready to use again! Easy peasy, right? It’s worth the extra few minutes a week to clean your brushes and ensure that buildup and bacteria are no longer free to haunt you. The artistry of enhancing our natural features with delicate sweeps of makeup is beautiful. The brushes we do it with should be, too. Ask Dr. Zoe – Is it Possible to Be Overly Emotional? You’ll love this podcast episode from This Grit and Grace Life: Miss Independent: Can You Be Healthy, Strong and Dependent? – 047!